A bellicose humanoid species with some superficial properties both aquatic and arachnid, the Aqualish of Ando can be found the galaxy over. They have hair-lined faces with large, glassy eyes and mouths dominated with inwardly-pointing tusks. Most anthropologists feel that the Aqualish carry a streak of anger and rage that hearkens to the early years of the species' evolution. They are known for hair-trigger tempers that flare without cause or reason. Ando is a marshy planet with very little solid land. Three races of Aqualish developed on Ando: the Quara, or fingered Aqualish was the higher caste and had hands which are articulated webs with opposable thumbs. The infamous Ponda Baba was a member of this group that evolved on the marshy islands of Ando. The Aquala, or finned Aqualish was the lower caste and had clawed hands, rather than the webbed ones. They evolved in the vast seas. The smallest and least known of the three races was the Ualaq. The Ualaq had fingered hands like the Quara, but have four eyes instead of two, like the Aquala. Like the Quara, the Ualaq preferred to live on land, rather than in the ocean. The Quara represent only one-tenth of the population of Ando and are the victims of intense prejudice on the part of their evolutionary neighbors. These groups have been engaged in a race war that has lasted for generations. Nonetheless, an unstable peace was accomplished when a spaceship from another planet landed on their world. Having never encountered extraterrestrial life, and fearing an invasion from the sky, the two groups banded together and directed their rage at the visitors, killing them without remorse. They kept the ship, however, and learned how to build more. Some legends say it was the Corellians who first came to Ando, while other tales say it was the Duros. Either way, they were defeated, and the Aqualish took the gift of advanced technology, and brought their belligerence and war-like nature to space. Though they achieved spaceflight, they couldn't advance the technology. Upon achieving spaceflight, the Aqualish immediately began a course of conquest. The Aqualish ravaged Ando's sister planet. The Old Republic quickly put a stop to it, and the Aqualish were demilitarized. The Republic set an arrangement in place wherein Republic teachers would help assimilate the Aqualish into galactic society, and stripped all Aqualish hyperdrive-equipped starships of weaponry. 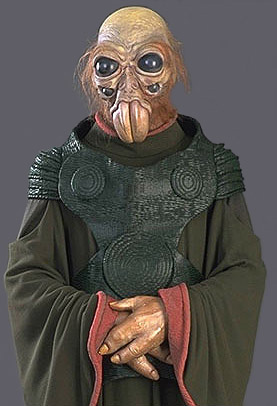 During the final days of the Galactic Republic, Andoan Senator Po Nudo seceded from the Republic, bringing his people and worlds into the Confederacy of Independent Systems. When the Empire took over Ando, they turned it into a police state designed to quell the various Aqualish uprisings. 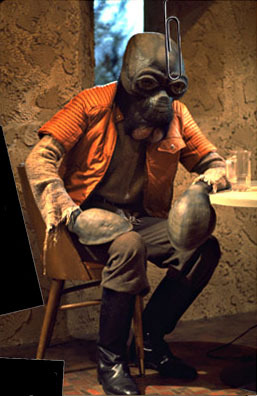 The Aqualish hated the Empire, but showed no interest in the Rebel Alliance. 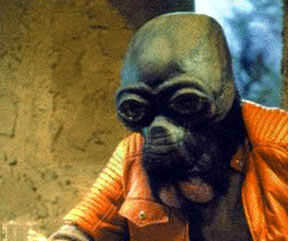 Nine years after the Battle of Yavin, Ando joined the New Republic. This made the Aqualish homeworld the target of a feint attack by Grand Admiral Thrawn's Bellicose before his assault on Ukio. During the Yuuzhan Vong invasion twenty-five years after the Battle of Yavin, Ando was offered to be spared by Warmaster Tsavong Lah if they destroyed all droid units and killed any Jedi on the planet. Thus, the Aqualish killed the Jedi Knight Dorsk 82, only to be invaded and crushed regardless. The few Aqualish that bothered leaving Ando have found purpose in the fringe of the galaxy, as tax collectors, repossession agents, smugglers, and bounty hunters. The following security police report from Bothawui shows how the slightest annoyance can set an Aqualish on an angry rampage. To this day, the Aqualish only steal technology and adapt it to their own purposes. Officer Kras'ka Lo'lar > Report 056.239 > I entered the restaurant and found the place trashed. Many of the patrons were under tables or running for the exits. A humanoid male, approximate 1.7 meters in height, with scarred features, seemed to be trying to calm a large Aqualish, who lunged forward with a punch that sent the humanoid flying. He landed on the floor next to me. I set my blaster on stun and fired at the Aqualish. It took two shots to take him down. He stumbled and fell to the floor. "Ponda!" The man cried suddenly, and he ran to the unconscious perpetrator's side. The man's horribly disfigured features showed an expression of disgust as he glared at me. "Why did you have to shoot him? He's an Aqualish. Small things upset him." "What 'small thing' set this off?" The marred man shrugged "I'd just told him that he's going to have to wait to get his arm fixed. He didn't that much." "His arm?" I looked more closely at the unconscious Aqualish and realized that he had only one real arm, an the other was a plastine prosthetic. He'd trashed place single-handed!